Find places to stay in Lawrenceville, GA and other fun things to do. View our list of attractions, activities, events, restaurants and visitor information. Large well-appointed suites with Wi-Fi and a free hot breakfast earn high ratings for the non-smoking Comfort Suites Lawrenceville. Free Internet, Non Smoking Rooms. Currently as low as $98.09/night! Freebies including a full country-style breakfast 24-hour cookies and cappuccinos and a lending library make the non-smoking Country Inn & Suites - Lawrenceville a well-loved hotel among our guests. Swimming Pool,Outdoor Pool, Non Smoking Rooms. Currently as low as $50.11/night! Full kitchens and low rates near the numerous companies stores restaurants and attractions of Atlanta's busy northeast suburbs make for cost-effective convenient lodgings at Crossland Economy Studios - Atlanta - Lawrenceville. Pets Allowed, Non Smoking Rooms. Currently as low as $60.80/night! Offering free internet free breakfast and impressively low rates the pet-friendly Days Inn Lawrenceville is across from Gwinnett Medical Center and 10 minutes off I-85. Free Internet, Free Breakfast, Pets Allowed, Non Smoking Rooms. Currently as low as $106.25/night! 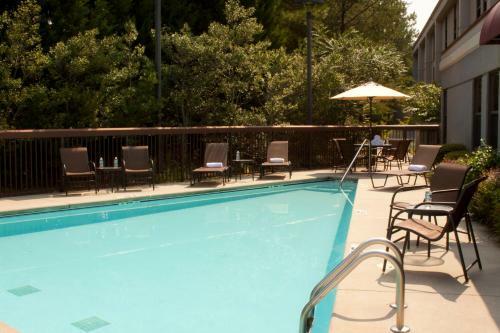 A saltwater pool elegant garden patio free hot breakfast and more add up to high ratings from our guests for the non-smoking Hampton Inn Atlanta I-85 Gwinnett - Sugarloaf GA. Amenities abound inside and outside the 127 rooms of this mid-rise hotel. Free Internet, Swimming Pool,Outdoor Pool, Non Smoking Rooms. Huge flat-panel TVs a generous free breakfast and not just free coffee in the lobby but strawberry-lemon water too lead to top ratings from our guests for the Hampton Inn Lawrenceville. Free Internet, Swimming Pool,Outdoor Pool, Non Smoking Rooms. Spacious suites with flat-panel TVs plus a 24-hour gym and free hot breakfast are some of the highlights for our guests at the Holiday Inn Express Hotel & Suites Lawrenceville. Free Internet,Outdoor Pool, Free Breakfast, Non Smoking Rooms. An outdoor pool complements a trifecta of free parking breakfast and Wi-Fi at the non-smoking Homewood Suites by Hilton Atlanta - I-85 - Lawrenceville - Duluth. Free Internet, Swimming Pool,Outdoor Pool, Pets Allowed, Non Smoking Rooms. Currently as low as $62.54/night! Well-equipped rooms with free Wi-Fi available make the Magnuson Hotel Lawrenceville a great deal outside Atlanta. Free Internet, Pets Allowed.